MOTORISTS headed for Logarta St. in Barangay Subangdaku, Mandaue City endured heavy traffic on Panagdait Road in Barangay Mabolo, Cebu City on Thursday morning, Feb. 7. One lane leading to the flyover in Subangdaku was closed to traffic due to repairs. CEBU CITY, Philippines — A text message from an unknown sender suggesting about his wife’s alleged affair with another man drove a husband to shoot his wife and himself in Tuburan town in northwestern Cebu on Saturday, February 2. CEBU, Philippines – A former Uber US executive is now the head of transport for ride-hailing giant Grab Philippines. At the launch of Grab's new "Better Everyday" campaign, its country head-turned-president Brian Cu announced some movements and new executives. DANAO CITY — Coast Guard ship BRP Nueva Ecija 3502 escorted to Danao City in Cebu a RoRo (roll-on/roll-off) ship that broke down after it left the Port of Isabel in Leyte on Saturday morning. MEMBERS of the 94th Infantry Battalion were ambushed by alleged members of the New People's Army (NPA) while on their way to the burial of a Cafgu member in Barangay Banuage, Guihulngan City on Monday morning, January 14. CEBU CITY, Philippines — A slight commotion occurred past noon today at the Cebu Metropolitan Cathedral with the sudden appearance of a team of uniformed men from the Philippine National Police’s Bomb Squad who, together with those from the Waterfront Police Precinct, came complete with a bomb-sniffing K-9 dog. CEBU CITY, PHILIPPINES – The signal shutdown during the 2019 Sinulog activities will affect the entire Cebu City, and parts of Mandaue City, Lapu-Lapu City, and even Bohol. INABANGA BOHOL - "Pinoy Big Brother Otso" pulled a surprise for two of its aspiring adult housemates. In its episode on Sunday, the show introduced its first eight adult Star Dreamers who will be given the chance to become an official housemate. 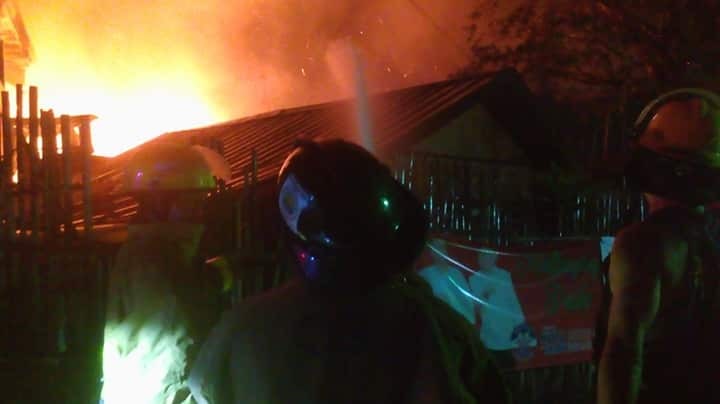 Firefighters train their hose on a burning house during the January 5 fire that hit Barangay Duljo Fatima.